The annual Perseid meteor shower is usually the best meteor shower of the year when the light of the Moon is not in the early morning sky. Peak shower activity was on the morning of August 13, 2015. Weather in Colorado was a problem, so we had to make a last minute decision on were it might be clear. We chose a spot in southern Colorado near the New Mexico border and we had wonderful skies and many meteors all night. In the early morning, the airglow to the north (left side of the image) appeared green to my eyes. The Perseid meteor shower was an inspiration for the John Denver song Rocky Mountain High. John observed the Perseid meteor shower during a camping trip in Colorado. The line "I've seen it raining fire in the sky" refers to the Perseid meteors he and friends saw that night. The image here is a composite mosaic of the early morning scene over 3.3 hours and nearly 600 images from 3 cameras. The image contains 31 meteors, though many more were recorded and have yet to be included into the composite. The image includes many deep sky objects. The small red spots are hydrogen emission nebula. There are also star clusters and galaxies. The meteors glow green, yellow and red from the vaporization of material from the meteor as it burns up in the atmosphere. For more on natural color in the night sky see Parts 2a, 2b, 2c and 2d on Color of the Night Sky and proper post processing to show those colors. The yellow and red light in the night sky is from airglow, light from molecules in Earth's upper atmosphere excited by solar ultraviolet light during the day and from cosmic rays. The molecules emit light throughout the night. The red is typically from hydroxyl (OH) 80 to 90 km high, and the green is from oxygen around 95 km high, and the two combined give yellow. Technical. This image is a 21-panel mosaic and each position in the sky is an average of several images (called a stack). The mosaic/stack is made from 584 images, 250 if which were used to make the mosaic plus others that were used for meteors. Each meteor is at the position among the stars at the time of the exposure where the meteor was recorded, thus placed into the mosaic at that same position. The images were obtained between 12:52 and 4:12 AM Mountain Daylight Time, so 3.3 hours of imaging time per camera. Imaging was done with 3 cameras. Canon 6D 20-megapixel digital camera, Sigma 35 mm f/1.4 DG HSM lens at f/1.4. The sky is made up of 246 exposures at ISO 1600 were made, each 30 seconds. Exposure of the stars were tracked using an iOptron SkyTracker. Exposures on the land (4 images) were made with the same camera and lens but with 150 second exposures, ISO 1600, f/1.4, and no tracking. Meteors were also recorded with a Sigma 24 mm f/1.4 lens at f/1.4 on a Canon 1D Mark IV digital camera (30 second exposures at ISO 1600) and a Sigma 15 mm f/2.8 lens on a Canon 7D (2 minute exposures at ISO 1600). These two cameras were on an equatorial platform to track the stars. Images from these cameras were scaled to match the star field in images from the 35 f/1.4 lens on the Canon 6D, and the meteors put into the mosaic at the same position against the stars. The full resolution image is 12,528 pixels high and 8589 pixels wide (108 megapixels) allowing for stunning large prints. 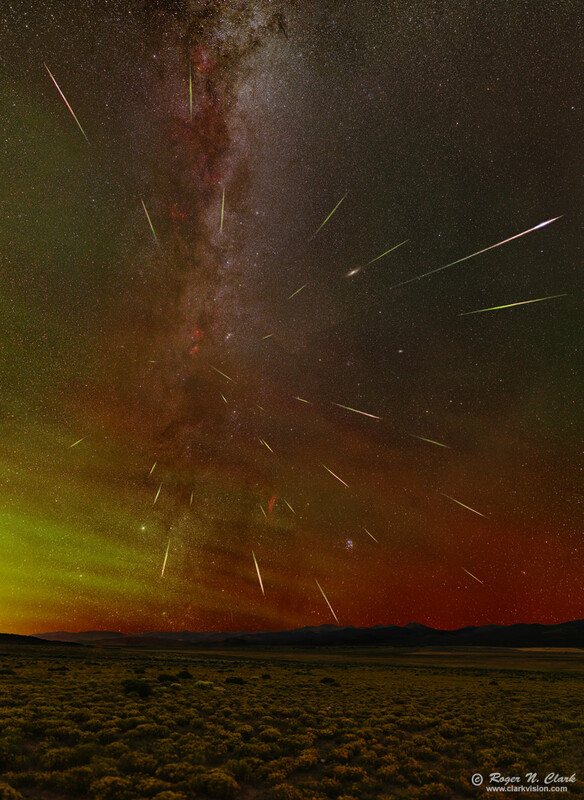 An enlargement of a sky portion is shown here: Perseid Meteor Shower and Airglow, 2015, along with full resolution crops of several deep sky objects. No dark frame subtraction, and no flat fields were used. The Canon 6D, 1DIV and 7D have the very low pattern noise at ISO 1600, and on-sensor dark current suppression, so there is no need to do dark frames. Modern raw converters correct for hot pixels and, with lens profiles, correct for light fall-off, so there is no need for flat field corrections. Processing was done with 16-bits/channel. Two relevant articles on how images like this cane be made: Nightscape Photography with Digital Cameras includes best lenses and settings for night and meteor photography. Night Photography Image Processing, Best Settings and Tips describes in the field setup and post processing.